I was giving a TEDx talk. My speech was carefully prepared and I had twelve minutes to speak. Three minutes in, I had no idea what the next line was. Among the audience was the president of the American University of Beirut, some two hundred people and my speaking coach, Dania. It felt like drowning in an ocean. Water was closing in and the sounds were muffled. Only my heartbeats were audible. I pleadingly looked at Dania hoping she’d remember. Reading my eyes, she distressingly mouthed the words “I don’t know”. So I realised that I was entirely on my own. Then I found my line. It felt like eternity, but it was merely few seconds. By not panicking, my mind thought it didn’t matter so it remained calm and silently found its way. Funnily, no one noticed the glitch. They thought I did it for a dramatic effect. “We had our eyes and ears glued on you to hear the next bit”, they said. So keep calm and act it out like a boss. Chances are no one will even notice. Speakers often don’t realise that a good speech or talk is not only about information, it’s also about persuasion and influence. When they wheelbarrow information and impersonally click through crowded slides they not only miss precious opportunities to further their careers, but also to position themselves as leaders and thought influencers. Having a presentation with the right structure and content has never been more important for creating impact. So how do you give your audience such a transformative experience? Here’s everything you need to know to nail your speech and hook your audience, every time. First, figure out who your audience is. What you want to say does not matter if your audience are not coming to hear it. Find that sweet spot at the intersection between what you want to say and what your audience is interested in, that’s the relevant content that you should be unravelling. Once you have that figured out, you are ready to design your talk but do not touch that laptop yet! Take a walk, go for a jog or do some physical activity to get your endorphins flowing. While you’re at it, think about what you want to talk about, flex your story-telling muscle and find your narrative. What is it? Why would one care about it? Sell the why not just the what! The first few moments and slides are your chance to get the attention of your audience, or not. Make it a smooth and easy take-off. Do not rush to the details before you are sure that your audience is coming with you. Engage them from the start, otherwise it’s very hard to hitch them back on again. Start with a story, remember how I started? Once you have your story or narrative in your head, grab a pen and paper. Outline your story using bullet points. Those bullet points will be the titles of your slides. Line up your slides while sticking to that narrative. Now we have the outline, it has a smooth and nice build-up. It follows a narrative. Let’s talk content. Images! Have one or two images (or graphs) per slide, strictly not more than that, and a few words if you absolutely need to. No sentences or paragraphs! This is key. Countless are the talks that I sat through with slides brimming to the rim with text and images with an ongoing voice-over that is different from the slide altogether on top of it all! If a crowded slide hits one in the face, one tries to make the decision whether to look and read or just listen, and by the time the decision is made the speaker has already moved on to the next slide. This is a recipe for confusion, frustration, and the audience abandoning your talk and daydreaming instead! Your power is being able to convey a message with an image and few words for emphasis. If your image is too crowded, layer it to introduce each layer separately. Use animations and effects smartly to serve your idea and presentation rather than to dress it up. Choose a modern font. Not comic sans, sans blague! Having well thought-through presentations position you as an expert to be trusted. Thus it’s essential that you know your script, your material and be prepared. Preparation helps you think of the bigger picture, put things in context and reflect on your assumptions if you had made any. Practicing helps you design your sentences smartly and say the most with the fewest words possible, rather than ramble on and never hit the point. However, prepared does not mean staged. If you practice a lot make sure not to slip into a boring gear and never shift out of it otherwise, I tell you, you’ll find us snoozing. Feeling like there’s a stone brick at the pit of your stomach on your big day is normal, but that’s only your brain tricking you into a fight-or-flight mode. How do you convince it otherwise? Here’s a trick my coach Dania taught me that always worked for me: before you’re due to speak, go somewhere private (restrooms work well usually) and pump yourself up. Jump, squat, punch the air. Yes, get it all out. Look at the mirror, smile and tell yourself how great you will be, how hard you worked and how you’ve got it all. Punch the air a bit more. Now you are in the room where you will speak and you can punch no more. It’s time to calm down, in fact. Whether it’s waiting through the introduction or for the speaker preceding you to finish, this certainly does not need to be a time to dread. If you are anxious, an extremely efficient exercise is to simply breathe. Take long inhales and exhales to slow down your heartbeat. The more anxious you are the longer your exhales should be. Perhaps try to inhale to the count of four and exhale to the count of five or six. Trust me, I do it every time and I get so relaxed I start to yawn. Just relax and let your confidence build up so that your authenticity shines through. As you take that stage, don’t forget to make eye contact and use your voice to engage your audience so they trust what you say and appreciate the time you’ve put into it. Ask for feedback. This helps you see things from a different perspective and improves your presentation skills. Join a Toastmasters club. It’s an excellent venue to practice public speaking and work on your body language and voice projection. Chair meetings if you can. Taking charge and moderating the discussion teaches you to appreciate people’s ears and how to connect with them in a genuine way. Always welcome speaking invitations, especially those you think you are not good enough for! That’s only your imposter syndrome playing you. One thing I learned from public speaking is that it’s not only what you say that matters, it’s how you make people feel. If you make it your genuine goal to make people connect with what you say, or learn something from you, they’d appreciate you for it so leave good lasting impressions. My last tip is remember to smile. Smiling while speaking reflects confidence and authenticity. Then it’d be hard to look away! Ghina Halabi is a Space scientist, public speaker, blogger, mentor and published scholar. She is an invited speaker and panelist at several international astronomy conferences, public events and interdisciplinary forums (e.g. Global Scholars Symposium, National Astronomy Meeting, UN Space for Women Expert Meeting). She is the founder of “Scheherazade Speaks Science”, a science communication platform to improve the representation and visibility of female scientists. This article is based on a talk that Ghina gave at the “Women in STEMM Media Training” workshop by the Communications Office at the University of Cambridge. This entry was posted in Advice for PhD Students, Presenting and tagged how to give excellent talks at conferences, public speaking, science communication, women in academia on July 13, 2018 by Marialuisa Aliotta. I have a huge announcement and a little gift I want to give you. My new book: Mastering Academic Writing in the Sciences: A Step-by-Step Guide has finally been released today! If you have been following me for a while now, you know about my work with Academic Life and how I have been helping hundreds of PhD students and early career researchers from around the world to showcase their research with effective writing. And I finally did that! With Mastering Academic Writing in the Sciences: A Step-by-Step Guide. 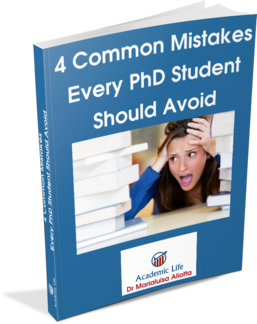 This book is all about giving you an easy framework to follow when you need to write up your thesis or research paper. How many times have you put off making a start? How often have you felt anxious, overwhelmed and unsure on how to summarise years of research and hard work into a self-contained thesis or paper? Maybe you want to stay in academia or maybe you don’t. Either way learning how to master writing skills is an asset that will serve you for life. The reality is… you now have an opportunity to learn those skills. And I’d like to show you how to do so by taking you through a simple yet effective step-by-step approach and by sharing with you everything that I have learned about academic writing in the last decade. If you know my story, you know that I have been struggling a lot with academic writing when I was a student and it took me a great deal of effort and dedication to learn to write well. I have read tens of books on the subject and attended various workshops and seminars. And just in the last decade I have been able to offer expert advice to students like you, drawing from my experience of publishing nearly 100 research papers in my field, chairing the editorial board of an international collaboration and now publishing a book about… writing! How do I do it? How do I help other scholars achieve the same level of proficiency and confidence with their writing? How do I support students to get published even if they have little or no experience with writing a paper? That is really broken down in this book in a way that everyone can understand and apply and, importantly, that you can do too. I am truly excited about this book. The time has come for it. So, here is the deal: I want to give you a £10 Amazon voucher for you to spend on anything you like. The reason I do this is because I would like to ask a simple favour from you. The book has officially been released today, Monday April 9th 2018, and when I look on Amazon this morning I discovered that it has already sold out! You can still get a copy directly from the publishers at CRC Press, Taylor & Francis Group and if you act quickly you may still benefit from the promotional discount they are offering at the moment. If you get this book and you love it and it inspires you, I ask you that you go on Amazon and post a review about it. Just talk about the book. Get the buzz out there, so that when other people who find out or hear about this book go to Amazon, they’ll see reviews out there. Positive or negative. I am not asking for an endorsement from you. I am just asking that if you get this book (and my gift) you post a review for me. Of course, if you want to blog about the book or share the message with your friends to help me get my own message out there, I’d be deeply grateful. But please note: I will only be able to fulfil the first 10 orders, so you need to act quickly. And if you do not manage to be among the first 10 people to email me, I will send you my 3 Free Bonus Videos on Writer’s Mindset, Tips and Strategies to Avoid Procrastination, and Weekly Check-up to help you get going with your writing project and staying on track. These are the same videos that I share with my private clients on my Hands on Writing online course. So, here is the link again. Click here to order your copy and I’ll look forward to hearing from you! To your successful academic writing! This entry was posted in Academic Writing, Advice for PhD Students, Books, Resources and tagged academic writing in science, course on academic writing, how to phd writing, how to write PhD thesis, how to write research papers, PhD, research papers writing, step by step approach to academic writing on April 9, 2018 by Marialuisa Aliotta. I am one of the world’s worst at proof-reading my own work. I’m quite good at revising, but not so good at the final checks. Regular readers of this blog will sometimes spot the odd proofreading omission – the good news is that I usually pick it up, albeit often after a few days 😦 . Proof-reading isn’t an easy thing to do – most writers are inclined to see what we thought we’d written, rather than what we actually have. We miss the odd spelling mistake, missing comma, over long sentence, the too often repeated word. It’s hardly surprising we miss these slip ups as most pieces of writing that are ready for proof-reading have been through multiple drafts and revisions. The proof-reading trick is to try to make the text appear unfamiliar and strange, almost as if someone else had written it. This entry was posted in Uncategorized on October 30, 2014 by Marialuisa Aliotta.